Should you be allowed to use a phone in the cinema? 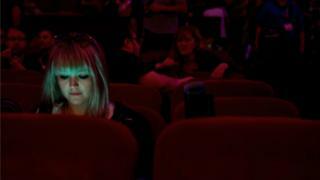 A proposal by a US cinema chain to let customers use their phones during some film screenings unleashed such a powerful blast of outrage that the company quickly reversed it. But is allowing texting in cinemas really such terrible idea? Adam Aron, head of AMC Entertainment, only had to float the idea of making some cinemas more "texting friendly", and film fans all over the world reacted furiously. "Worst idea ever," was the conclusion of many people on social media. "You're basically pandering to rude people just to make money," said one person on Twitter. "I will not pay to have people texting all around me." Just two days after Aron's interview was published, the company was forced to withdraw the idea. "There will be no texting allowed in any of the auditoriums at AMC Theatres," it said in a statement. "Not today, not tomorrow and not in the foreseeable future." Hollywood film blogger Alex Billington is one of many who rejoiced at AMC's rapid backpedalling. "Texting in the theatre completely ruins the movie," he says. "This is something we have to fight against on a social and cultural level." In 2014, an argument between two men over texting in a cinema in Florida ended in a fatal shooting. While that was an extreme case, most people would agree that glowing phone screens and fingers tapping can be infuriating. "The only senses you have in the cinema are vision and hearing," says Ann Hornaday, chief film critic at the Washington Post. "Anything that gets in the way of that sensory experience is rightfully considered an inappropriate distraction. "When we go to the cinema, we all enter into a contract - so we do feel a little betrayed when someone behaves badly." At the same time, she does understand the challenge cinemas face to attract younger viewers. "We need to reshape our product in some concrete ways so that millennials go to movie theatres with the same degree of intensity as baby boomers went to movie theaters throughout their lives," Aron said in his interview with Variety magazine. "When you tell a 22-year-old to turn off the phone, don't ruin the movie, they hear please cut off your left arm above the elbow." A survey in 2012 found that a majority of 18-to-34-year-olds believed using social media while watching a movie would add to their experience. "Young people place a high value on being 'always on'," says sociologist Julie Albright. "Millennials have become very good at multi-tasking so they think nothing of looking at their phone while doing other sorts of things including consuming films and television and other media." But Chuck Tryon, a lecturer and author of On Demand Culture: Digital Delivery and the Future of Movies, points out that while some young people may find it hard to put their telephones down, this is not universally the case. "It's a horrible reduction of a whole generation of people," he says. "As a film professor I know many millennials who want this non-distracted movie experience. "Some of the worst offenders in terms of texting in movies are often slightly older - maybe someone who has left their children with a babysitter and is checking up on them." But he too realises cinema chains are "really searching for options" to increase business. Cinema attendance in the US and Canada has been generally declining for the last decade, while films are being released on DVD or streaming services more quickly. Many cinema chains are already offering more comfortable seats, enticing snacks and alcoholic drinks. Allowing phones would be one more step towards making the cinema experience more like what viewers can get at home. Ann Hornaday says making particular areas or auditoriums "texting friendly" could benefit other audience members who did not want to sit next to someone with their phone on. "Maybe it would be better for people like me - it would quarantine the texters," she says. But Dana Stevens, a film critic for Slate, is not convinced. "I guess if all the rude texters don't mind being cordoned off into a single, awful screening room full of flashing, beeping phones that could work," she says. "But I don't think dividing audiences into two camps… is the way to keep theatrical movie-going alive." Much of the frustration of film fans comes from the apparent reluctance of cinema staff to enforce cinema rules, enabling some chains to use their strict no-texting policies as a marketing tool. In 2011 Alamo Drafthouse, a cinema chain based in Austin, Texas, posted a YouTube video of a voicemail message left by a seething customer after she was kicked out for using her phone. The video went viral and Alamo Drafthouse went on to use it as a public service announcement before screenings. The dilemma remains for other chains still struggling to attract new audiences while keeping core customers happy. The latest outcry over texting in cinemas will deter them from considering this option, says Chuck Tryon. "The entire movie Twittersphere exploded," he says. "I think the cinema chains have been sent a message. I do not see any change happening any time soon."